In Part I of my Favourite Food Things of 2011, I featured my favourite savoury dishes this past year. Originally the post was to include ALL my 2011 Favourites – savoury and sweet things, kitchen items, foodie reads, and grocery items. However, there seemed to be so much content in savoury dishes alone, I thought I would divide my “Favourite Food Things of 2011” into two posts with the first focused on savoury dishes and the second on everything else. Well… “Oops I Did It Again!”, as I started writing this post, I realized I had even more sweet things than the savoury to give mention to… three parts it is. I guess this should have been expected considering my dad is a baker by profession. I grew up eating cheesecake bars, nanaimo bars, and apple strudels for breakfast… and frequently as an after-school snack or bedtime snack. 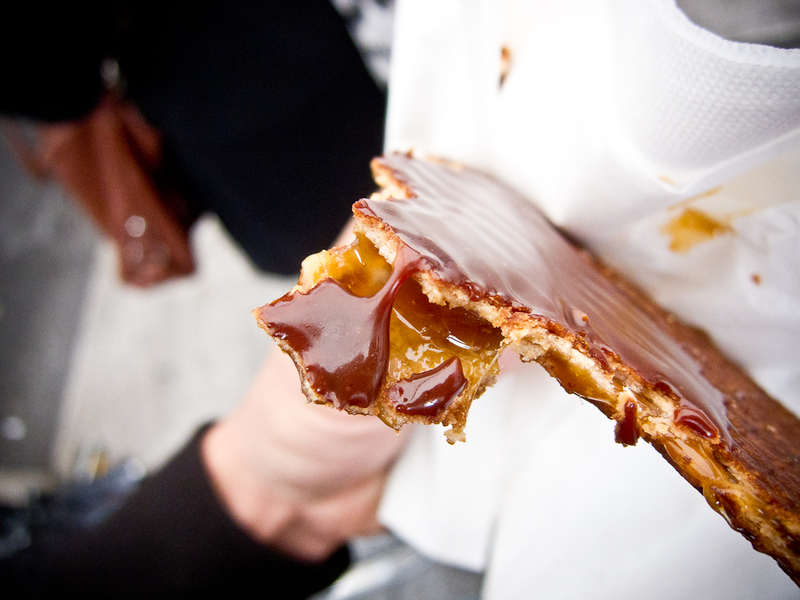 People tell me they crave chips and salty snacks but I have dreams of brownies, creme brulee’s, pies, and waffles. We had the Purdy’s group purchase program at my work. Discounts on chocolates? I didn’t need any more convincing. Perusing the order form, I was intrigued by the two varieties of Himalayan Pink Salt chocolates…Salted Caramels and Salted Peanut Butter. They sounded so good I bought two boxes of each intending them for Christmas gifts. I made the mistake of trying a salted peanut-butter chocolate and ended up eating 3 of the boxes in 2 weeks. Although the salted caramel was good, it was the salted peanut butter that had me weak-in-the-knees. Chocolate and peanut butter go together like bread and butter or pumpkin pie and vanilla ice cream – each is good on its own but exceptional as a combination. And when you add salt to it, the combination is only enhanced. In case you’re wondering, I did go back to Purdy’s to replenish the gifts (and buy more Salted Peanut Butter for me). Now that you know about my Chocolate-Peanut Butter obsession, no surprise that I also love the Chocolate Peanut Butter fondue from Melting Pot (see my previous post on Melting Pot). Not only is the chocolate peanut butter fondue itself amazing, but it comes with a decadent plate of goodies – strawberries, pineapples, bananas, cheesecake, brownies, poundcake, and cookie-covered-marshmallows. 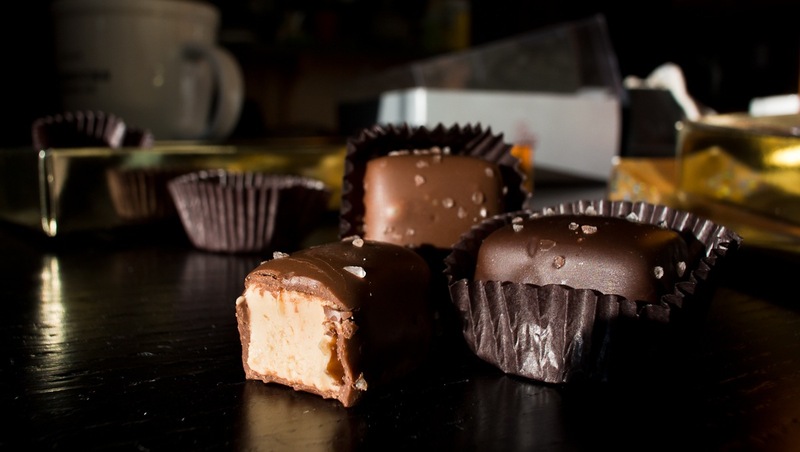 The only thing better than chocolate and peanut butter together is cheesecake covered with chocolate and peanut butter! Earlier this year, I reviewed Jelly Modern. I have had several maple-bacon donuts from different bakeries AND I’ve tried almost all the donuts at Jelly Modern, but the Maple-Bacon doughnut at Jelly Modern remains my favourite doughnut. It isn’t overly sweet like so many maple doughnuts. The bacon is complimented very well by the authentic maple flavour in their glaze. 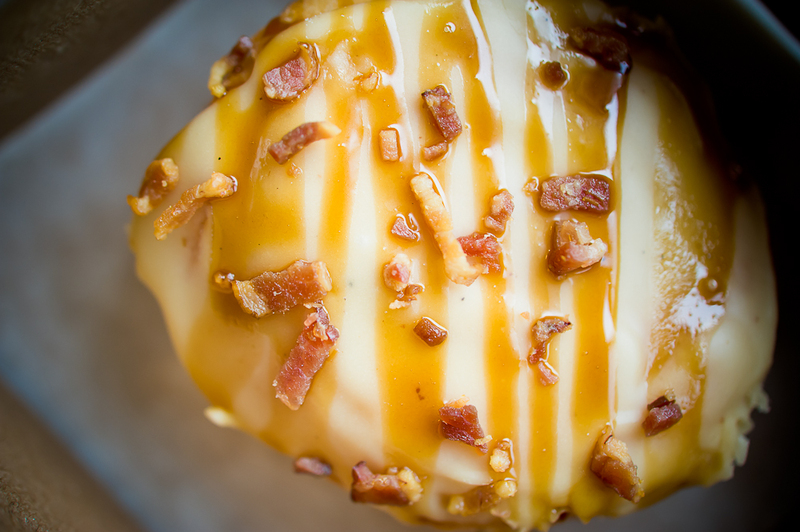 Jelly Modern is committed to locally-sourced ingredients, like the Valbella bacon they use in this doughnut. They also make each component of their goodies in-house. The quality of their craft is noticeable. In my history of doughnut-eating, this can only be topped by my first-ever bite of a fresh-hot-off-the-donut-line-Krispy-Kreme. We sussed out gelato in every Italian city we visited this year. 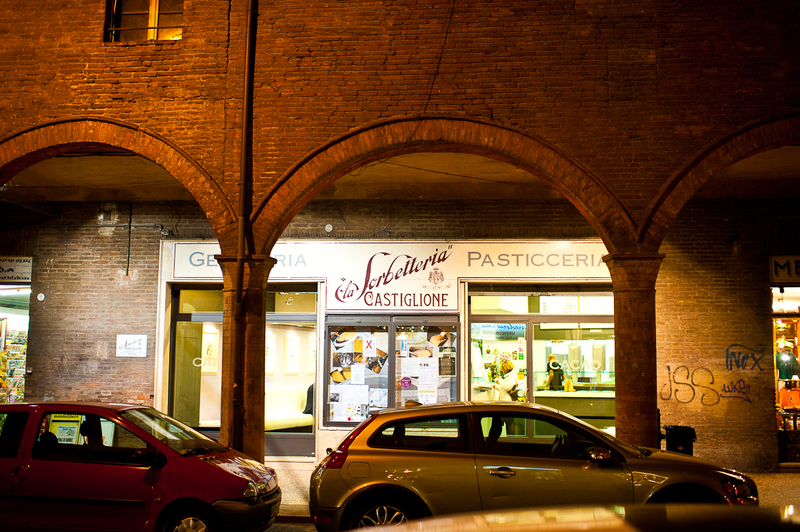 Out of all the places we visited, our favourite was La Sorbetteria in Bologna. As the name suggests, they have a good selection of gelatos and sorbettos. Being that D is lactose-intolerant and diabetic, La Sorbetteria’s non-dairy, and no-sugar-added options made this the ideal gelato place for us. We fell in love with their natural flavours and creamy textures (yes, even in those non-dairy, no-sugar offerings). We visited this place every day while we were in Bologna (trying over 15 flavours in total) but on our last night I had the Pera e Canelle sorbetto (Pear and Cinnamon). There was so much natural pear flavour packed into that little scoop of gelato, and the cinnamon was a nice warming touch. It was ahh-mazing and seems Mario Batali feels the same way about their melon sorbetto. 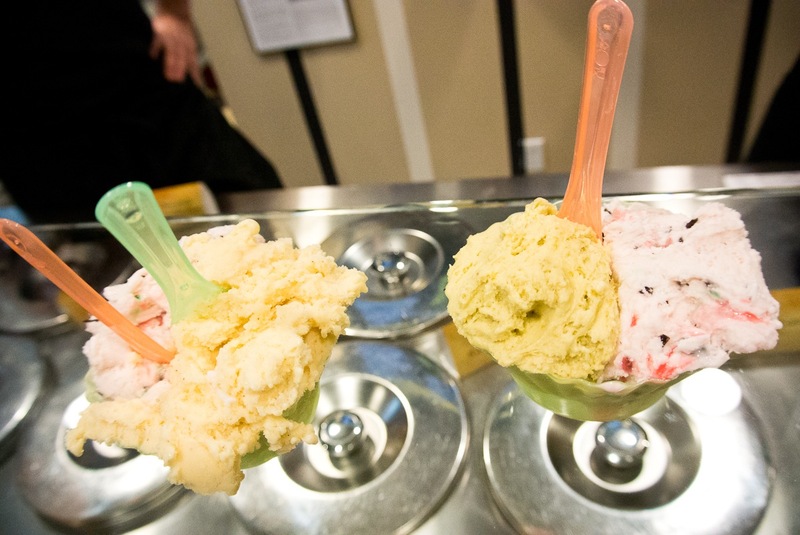 Italy isn’t the only place with great gelato. James, the owner and operator of Bella Gelateria has so much passion for his gelato that it can’t help but be exceptional. James’ passion is felt at each step of the gelato-making process: from sourcing the best ingredients, to maintaining the quality & handcrafted methods, to ensuring each customer receives exceptional service. It is a must visit each time I return to Vancouver. On a recent visit, I was blown away with the refreshing Candy Cane gelato but since that’s only available 2 weeks of the year, my favourite year-round flavours are the Salted Caramel, Tahitian Vanilla, and Thai Coconut. Each of those gelatos are packed with so much flavour. We visited the beautiful Vernazza in Cinque Terre, Italy this Fall and Most of the people we met in the 5-Terre were abuzz about Il Pirata. It was more than the buzz from their great coffee, people were raving about their pastries. We had to make a visit. Il Pirata is owned and operated by two brothers from Sicily who will emphatically talk your ear off about how Sicilian pastries are the best in all of Italy. Stopping in at 10am one morning, we met one of the friendly brothers, he insisted we have a cappucino and the Panzerotti filled with ricotta and cream. 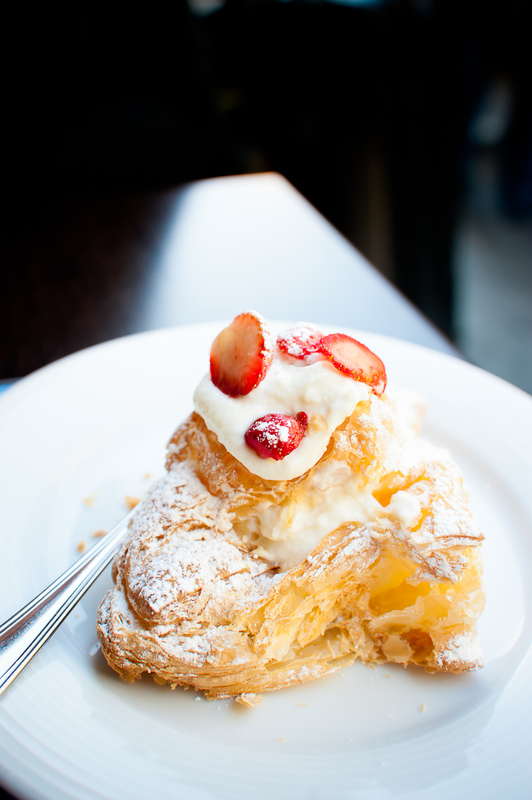 One bite of the flaky pastry and light custardy cream and we were hooked. Within 20 minutes, I had ordered and finished a second one of their delicious pastries, a buttery apple tart. We were told how lucky we were, that the shop makes 400 pieces of pastry each morning and usually sells out by 10:30am. What can I say, I have great food karma. I referenced Cafe Medina’s Fricasse as one of my favourite savoury brunch dishes over 2011, but Cafe Medina is famous for their Lavender Lattes. The first time I visited Medina, I knew I had to try it but I was nervous that the lavender flavour would overwhelm the coffee. Too often I’ve seen lavender-scented treats come out tasting soapy or too floral. The lavender in this latte was subtle in taste but very apparent in the aroma. It is creamy and frothy. The latte pairs well with Medina’s waffles, especially when topped with one of their six Middle Eastern inspired sauces (my favourite is the White Chocolate Pistachio Rosewater). Although there are much better Liege waffles around (see below), my brunch dilemma is usually whether to order a savoury dish or a sweet one. At $4.15 for a small waffle with a side of sauce, Cafe Medina makes it easy for me to order savoury AND sweet. The Bison in Banff used to be one of my favourite restaurants in Alberta. That is until, it changed ownership and chefs. Which is why I was ecstatic to hear that Grant Parry, Bison’s former executive chef had opened Wurst in Calgary. I was even more excited when Grant tweeted this in February, “For all the French Toast addicts in Calgary. Wurst will offer the same blueberry drenched awesomeness as The BIson, I know the Chef!” The first time I had the french toast at Wurst, I almost bounced off my chair, I was reunited with The Bison flavours! 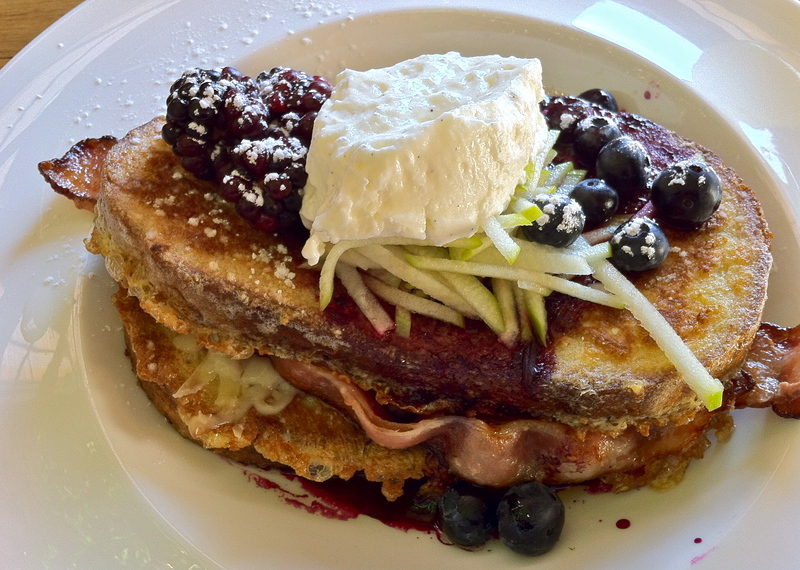 This french toast is stuffed with double smoked bacon and Sylvan Star gouda. Which is why I ALMOST included this dish in my Favourite Savoury List but with a name like “French Toast” and topped with apple slaw and whipped crème fraîche, I felt it was more of a sweet with savoury accents. Regardless, it is (to quote Parry) pure “blueberry drenched awesomeness”. I had my first Eva Sweet Waffle from their truck located at City Market this summer and was blown away by the texture and flavour of the waffle but above all, I fell in love with the sweet granules of pearl sugar cooked within the waffle. The waffle was so perfect, it needed minimal topping. Since that first vanilla waffle, I’ve had many waffles cooked by Bamir and his nephews and they are always great! Eva Sweet Waffles moved into the CAB cafeteria at U of A this Fall and I’m jealous of the U of A students who get to enjoy Bamir’s Liege waffles on a daily basis. The larger indoor space also gives Eva Sweet the ability to try different flavours and store ice cream to top their waffles with. When we visited the Albert Cuyp Market, I was in search of Dutch dishes and sweets to indulge in. We found a little stand empty of customers with an elderly man cooking Stroopwafels. Trying a fresh-cooked Stroopwafel was one of my goals for our trip to Amsterdam but this experience far exceeded my expectations. The man handed me the stroopwafel on a paper napkin – warm gooey stroop sandwiched between two very thin wafels, then dipped in hot chocolate. It was just off the iron and the stroopwafel master had to warn us to eat the wafel horizontally so the warm stroop didn’t leak out. I was tempted to eat another 2, but seeing there were still a few food-stands at the Market we hadn’t yet visited, I settled on buying a few packs of pre-made mini stroopwafels. I still dream of that fresh-made one though. So as you can see, 2011 was a great year – I found and fulfilled that foodkarma dreamy sweet spot many times. Hoping 2012 is just as sweet. 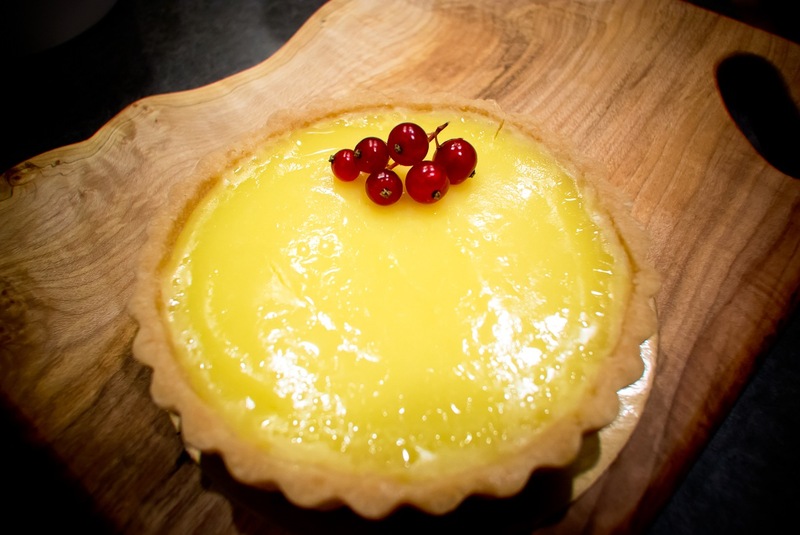 To read about my Favourite Savoury Dishes from 2011, visit Part One of this series. You’re savoury list was good, but this sweet list gave me goosebumps! And now I know that until I can make it to La Sorbetteria Castiglione, I’ll have to take a trip to Calgary for donuts and french toast. Yes – trip to Calgary for doughnuts and french toast is a must… Mmm I’ll have to remember that rec. We’re trying to get to SF and Cali this Fall. Happy to say we did the same ice cream place in Bologna twice and had the same Sicilian pastry in Vernazza. Yes! Yes! yes! Missed the donuts last trip to Calgary on purpose… now I regret it. Holy cow… you are my HERO! Please let me knwo any time through the year when you have another life altering experience. I don’t want to miss out! 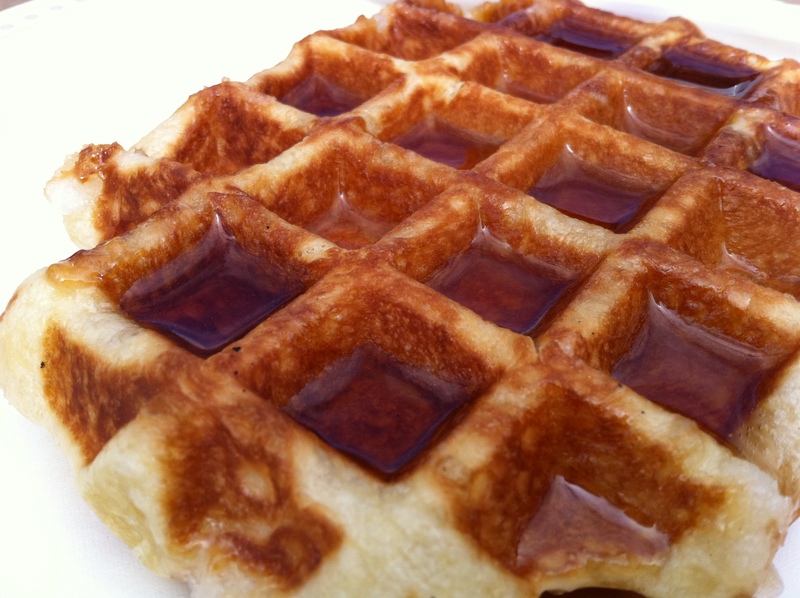 Time to wipe the drool off my chin and head to bed with thoughts of sweet waffles dancing in my head! I’m crossing fingers we get into French Laundry as well! Thinking it would be a great spot for D’s birthday dinner! We also want to hit up Gary Danko and Chris Cosentino in SF. So many places to travel and so many dishes to try… so little time! nomnomnom, Thanks for checking out this post – Wurst is definitely worth checking out. Being a beer hall, their busy time is in the evenings but I love their brunch dishes. How can you say no to this french toast, braised bison shortribs w/ poached eggs & hollandaise, and smoked salmon benedict on home-made buttery biscuit? I can eat all that IF I have 2 other people with me! Well and if they are sharing-type-people. I heart SF, Carmen! For once, I can give YOU restaurant recommendations rather than the other way round. I’ll drop you an email with the places we went to last time we were in San Fran…! would love the rec’s Cheryl!! Enter your email address to subscribe to foodkarma and share information on good eats.